The same configuration costs about $220 elsewhere, in both the smaller (18mm) and larger (23mm) band options, both of which are available on Woot. That makes for a decent discount of $70 off the retail price. Unfortunately Woot isn't offering any other case or band options, so the rather flashy Champagne model is your only choice at this price. It's almost ironic - if you want to save money, you'll have to choose the more conventionally expensive model. Versions of the original with leather bands are going for around $200 at the moment, though you can find them as cheap as $150. 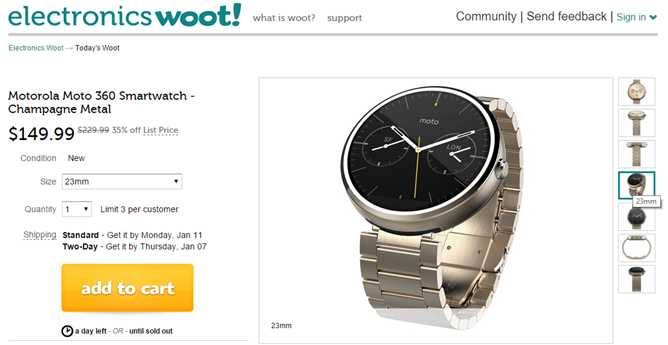 While the second-gen Moto 360 is a marked improvement over the first-gen Android Wear watch, an equivalent gold model costs about $380. Since this is a Woot daily deal, you only have until midnight Central time to get an order in. Shipping is a flat $5 for standard, and unfortunately, Woot only sells to the United States. It's possible that stock will run out since the discount is so steep. If you're going to order one, do it soon, or your choice of band (or the watch itself) might not be available. [Weekend Poll] What Is Holding Back Android Tablets More, The UI/Features Or The Apps?